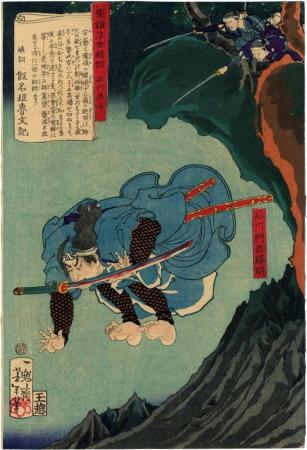 "A samurai identified as Ishikawa Mon'ya Katsuaki dodges a gang of pursuers by making a daring leap off a cliff with a bloody sword gripped in his teeth (blade exposed outward, of course), from a tale credited to Momokawa Engyoku." This information was provided by Scholten Japanese Art. "Rough tales of the floating world told on eastern brocades (Azuma nishiki ukiyo kōdan) is a complex series in its content and in the interpretation of the meaning of the series title. In the past, little effort has been made to further our understanding of the term kōdan (稿談) in the title which, when written with different homophonic characters, refers to the tradition of story telling (講談). 'Story telling' is a central element in the set, since the series title in each print is followed by the name of a well-known raconteur (kōdan-shi) from the late Edo and early Meiji periods. The character used for kō in the title kōdan connotes 'rough', 'sketchy' or 'unpolished', as in a 'rough manuscript' or 'rough version'." Quoted from: Yoshitoshi: Masterpieces from the Ed Freis Collection, page 89. There are four other prints from this series in the Lyon Collection: #s 369, 370, 957 and 958.